The former mission in San Antonio, Texas, was the site of the Battle of the Alamo, which is forever a symbol of the fight for liberty and the courage of those who fight for it. Notably, this battle was the place of death for all but one of the defenders, the dead including frontiersman and former congressman Davy Crockett, adventurer and knife maven Jim Bowie, and the 26 year old attorney-turned-commander William Barret Travis led the Texians in their famous battle even as the Republic of Texas was being born, and its founders were signing their Declaration of Independence. The Texian Army was founded in 1834 in order to fight Mexico for the independence of Texas. That army was comprised of men and women who lived in Texas, who considered themselves Texas colonists. These troops included those who were born and raised in Texas as well as volunteers from the southern United States, and immigrants from Ireland, Scotland, Wales, Sweden, the Netherlands, Germany, and England. The church was founded on the banks of the San Antonio River in 1718 and was called Mission San Antonio de Valero, named in honor of St. Anthony of Padua. It was taken over by Spanish troops at the turn of the 19th century and used as a fort during the Mexican War of Independence. The mission, surrounded by cottonwood trees, was called "Alamo" which is the Spanish word for cottonwood. Of course, the fort became Mexico's upon their independence from Spain, and it remained a fort. In December of 1835, in the center of San Antonio, the Texas Revolution was just getting heated up, and a group of Texians spent five days going from house to house in the middle of town, finally taking control of San Antonio and capturing the garrison. In the middle of February of 1836, about 200 Texians led by Colonel Jim Bowie -- of Bowie knife fame -- and 26-year-old attorney William Travis were garrisoned at the Alamo. On February 23, 1836, General Antonio Lopez de Santa Anna and his Mexican troops, who numbered in the thousands, ordered Mexican soldiers to surround the town of San Antonio. The Texians retreated across the San Antonio River to the Alamo. Santa Anna and his army began what would be a 13-day battle before the enormously out-numbered Texians were finally overpowered. Among the defenders of the Alamo were doctors, lawyers, an ex-congressman, and even the famed frontiersman Davy Crockett; they ranged in age from 16 to 56; and several women and children were inside the mission, the youngest being an infant named Angelina Dickinson. By happenstance, and due to the usual commander being absent in the days leading up to the attack, there were two commanders during the battle: Commander Travis commanded the regulars, while Jim Bowie was commander of the volunteers. Santa Anna sent a courier with a message demanding that the Texans surrender. The response from Travis: a cannonball. The Centralists, those who believed all power should come from the Mexican federal government, began knocking down the walls of the fortified church, hoping to knock them all down, upon which those inside the garrison would have no choice but to surrender. On February 24, Bowie became gravely ill with what was called "a disease of a peculiar nature," and which, according to various diagnoses, was typhoid pneumonia or "hasty consumption," also known as tuberculosis. He collapsed, which soon prompted him to tell the volunteers to consider Travis their commanding officer. During the battle, Commander Travis wrote a series of letters, five in all, beseeching all he could to send help to those in the garrison. The first letter, written to the fort at Gonzales on February 23, as Santa Anna's men converged upon the Alamo, said, "The enemy in large force are in sight. We want men and provisions. Send them to us. We have 150 men and are determined to defend the Alamo to the last. Give us assistance." Travis spent the night anxious about the fact that the only hope they had was the chance that reinforcements would be sent. On March 1, the Convention of 1836 was in session, the interim government was being organized and the Texas Declaration of Independence and the Constitution of the Republic of Texas were being written. On March 2, the Declaration of Independence was adopted, and on March 4, future Republic of Texas President Sam Houston was named commander-in-chief of the provisional government. Meanwhile, a contingent of thirty-two troops arrived, and while Travis was grateful, he also knew that they were not near enough to help. His third letter, written March 3, said, in part, "I look to the colonies alone for aid; unless it arrives soon, I shall have to fight the enemy on his own terms." On March 5, realizing the gravity of the situation, Travis had all of the men assemble in the center of the mission. He said, "Our business is not to make a fruitless effort to save our lives, but to choose the manner of our death. He listed the options that remained for the defenders: surrender and be executed, fight their way out of the compound and be cut down by Santa Anna's troops, which now numbers in the thousands, or stay in the fort and "resist every assault, and to sell our lives as dearly as possible." He announced that he was prepared to die. He went on to explain that he understood if any of his men were not willing to perish at that time, and he used his sword to draw a line in the sand. He looked at his troops and invited those who were prepared to die in the cause of freedom to step over the line. Only two men did not step over the line. Jim Bowie, who was still too sick to stand, had his cot carried over the line. There was one man who did not cross it, Louise Moses Rose, a mercenary from France, who made his way past Santa Anna's men and told the story to a man who gave him shelter as he traveled back to Louisiana. 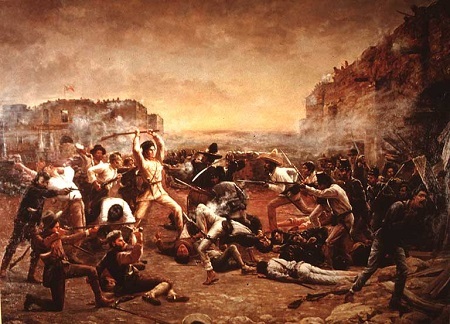 At approximately 5:00 on the morning of March 6, twelve days into the battle, Santa Anna ordered his troops to storm the Alamo; and more than 1,800 of them did just that. But the Texians refused to surrender, and they gave everything they had to the fight. Cannons and rifles blazed as ammunition drove into the Centralist cadre. They regrouped and continued the march through the defensive line. Travis was among the first dead, shot at his post on the cannon platform at the northeast corner of the garrison, and those defending the perimeter scurried into the fort, into the dimly-lit and tiny rooms of the Long Dorm, only to be followed by Centralist troops with whom they engaged in hand-to-hand combat. After the bloodbath there, the Centralists moved into the chapel. The entire assault was over by sunrise, less than an hour and a half after it began. A handful of defenders remained alive through the assault, but they were summarily executed before the sun had been up two hours. In all, between 188 and 257 defenders were killed defending the fort. Bowie was killed sitting up against a wall in his cot, his pistols empty and his knife bloodied. It is unclear whether Davy Crockett died in battle or was among those executed by the Mexican troops later that morning. The surviving non-combatant slaves, women, and children were led from the Alamo and given safe passage through Santa Anna's line. They were also each given two dollars and a blanket. "Take care of my little boy. If the country should be saved, I may make him a splendid fortune; but if the country should be lost, and I should perish, he will have nothing but the proud recollection that he is the son of a man who died for his country." Shares video and photographs of the Alamo and the battle that stands, even today, for courage and standing one's ground. Additionally presents audio recordings of speeches given at or about the Alamo. Learn about how Jim Bowie, Davy Crockett, William Travis, and their brothers in arms stood their ground. Also shares photographs and illustrations of the way it looks today and the way it looked then. The official site of the Alamo contains information about taking in-person tours, the living history displayed there, a virtual tour, media center, and a detailed history of the battle at the Alamo. Also contains a gift shop. Search for Alamo on Google, Bing, or Yahoo!